Picture by Courtesy of; http://today.mims.com... Love Career Survey, More about it! Everyone has a unique way to describe themselves and their interests. Love Career Survey lets you rate activities you like, your personal skills, and school subjects you enjoy. Then you can see which career is a match for your interests. Generally speaking, the career survey will take you about 5-10 minutes. Once you finish the survey, you will see a list of career choices that are suitable for you. 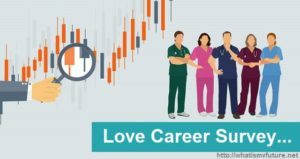 As you can … [Read more...] about Love Career Survey, Explained in 3 comprehensive Guidance’s!